LAST CHANCE - Marathon Registration Coupons! Tonight is your last chance to get this special discount for Fargo Marathon Registration. Wahoo! I just registered myself for the 10K and am already questioning my mental health. Lord willing, I will cross that finish line May 22nd. 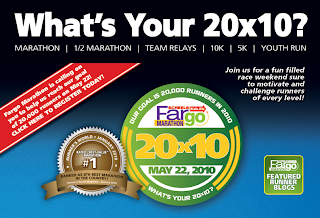 For more info on the Fargo Marathon, go here. Since my husband and I are relatively new home-owners, I've begun to LOVE shopping at Menards! In the next few weeks, I hope to begin posting more Menards deals, as they often have great "FREE-after-rebate" deals. Forever Produce Bags, 16 ct box $2! Magic Eraser, 2 packs $1.68! Use the .75 coupon from the Home Made Simple coupon booklets if you've ordered them in the past. Want to order one? Go here to request one. These are packed with high value coupons from brands like Cascade, Febreeze and Swiffer. Remember, these deals end tonight! If you're already familiar with the rebate program, there are lots of great freebies available through today as well! Edit: Sunday Coupon Preview had a RedPlum insert listed for this weekend, but I haven't found any in the Sunday Star Tribune. Anyone else have the same problem? Looks like 2 coupon inserts today, a Smartsource and a RedPlum. For anyone new around here, I always recommend buying the Star Tribune over the Fargo Forum. Often the Forum carries smaller inserts, or fewer of them, as we are a smaller market than Minneapolis. Better yet, Sunday's coupons are now in the Saturday Star Tribune! And, for only .75! But, make sure it has the inserts before you buy! As far as I know, there should be only 2 inserts this weekend. If you can't find a paper with both inserts, Sunday's Star Tribune cost $2. Coupons.com has released some HOT new coupons, and some coupons are already starting to reset for March! Go here to check them out and print now, while they're available! Plus, the .75/1 Gold'n Plump coupon has reset! I always print this at the beginning of the month, while it's available, because this one seems to always be gone by the end of the month! Tip: You get 2 prints for all of these coupons! After the first print, they usually move to the last page, but keep scrolling and you'll be able to print them again! We know that even if they're not included in the sale, Moorhead Hornbacher's has the new "sub" lunchables for .98, and Southgate Hornbacher's has them for $1.19. Use the $1/2 coupons from the .50/2 coupons from the 1/3. 1/17, 2/7 and 2/21 coupon inserts (will double to $1/2). Final price: $2.18 each when you buy 2! What other great deals do you see at Hornbacher's this week? Interesting fact: I saw in the news that Dean Hornbacher (President of Hornbacher's) is retiring after 42 years. He is the son of Ted Hornbacher, who opened the first Hornbacher's store in Moorhead in 1951 as Ted's Supervalu. Not a bad price on the TP or towels, but not a stock-up price. Keep in mind that the in-ad coupon IS a Manufacturer's coupon, meaning that you can't use other coupons in addition to it. Tip: Since it is a Manufacturer's coupon, you should be able to use it anywhere. Anyone know the price of these at Walmart? Also, Sunmart has LOTS of new Our Family coupons here. Let us know if you find any great deals with these coupons! Any other deals you saw at Sunmart this week? Let us know in the comments! FREE Photo Session During Your Child's Birthday Month! Check out this awesome freebie for your child! Go here to print a coupon for a FREE photography session during the month of your child's birthday, courtesy of Spray Photography. Good only for 2010 photography sessions. For more details and to print your coupon, go here. 10 Ct Capri Sun FREE with coupon and $25 purchase! Pay only $2 or .50 each! Buy 2 Tuna Helper for $2, get 3 Tuna Free with in-store Cashwise coupon! Final price: $2, only .40 for each item! Use .75/3 coupon from the 1/3 or 2/7 coupon inserts that doubles to $1. Final price: $2, only .34 per item! Great item to donate even if you or your family won't use some of it! Use the .75 coupon available here or here (add the coupon to your "shopping list" then print. Even if there is no list, the coupons will print). Final price: FREE if the coupon doubles! Only .25 if the cashier doesn't allow the double. EDIT: Looks like the new "sub" variety aren't on sale. Hang onto those coupons and be sure to check the reduced for quick sale meat rack - they often go down to .99 there as well! Final price: .94 each! Definitely a stock up price! Normally I like to buy apples for less than $1/lb, but for organic this is a great price! What other awesome deals did you see at Cashwise this week? HOT! Unadvertised Baby Wipes Deal at CVS! UPDATE: Deal is now dead! I don't normally post here about CVS deals, as there are LOTS of other great blogs out there already doing it, but it's too good of a deal not to mention! 216 Count Wipes packages are ringing up at $2.50, regularly priced $7.99! You'll need an Extra Care Card to get this sale price. Be sure to price check these at the coupon center/price scanner just to be sure, as this price may change since it's unadvertised. Don't have an Extra Care Card? Pick one up at the front counter in the store, then ask an associate to point you toward the coupon machine. 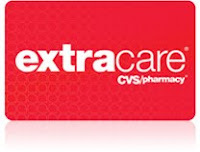 Scan your card and cross your fingers - many people are getting $2 CVS coupons good on any size Huggies wipes! Use that and pay only .50 per bag! Have any .50 or .75 Huggies wipes coupons laying around from home mailers? Use them to sweeten the deal even further! I had both and got 3 packs for only $4.75! As of last night, Fargo 13th Ave CVS was well stocked, and as of this morning Moorhead CVS was as well. National Pancake Day - Free Pancakes at IHOP Tomorrow! Tomorrow, Tuesday February 23rd is National Pancake Day and IHOP is offering a FREE Short Stack (3 pancakes) to each guest tomorrow between 7AM and 10PM. What a fun freebie! IHOP asks that you consider making a donation to the Children's Miracle Network in support of Meritcare Children's Hospital. For more info, go here. New Mambo Sprouts Coupon Book! There is a new Mambo Sprouts coupon book available! You can find it at both Fargo and Moorhead Cashwise locations, usually on the Natural Foods counter. Go here to sign up to receive these by mail 3 times/year as well. Fargo Marathon - Registration Coupons! Who would've thought? A coupon code for Fargo Marathon registration! I'm a fan of the Fargo Marathon on Facebook and right now they are offering a Valentine's special discount on registrations through February 28th! Anyone out there planning to participate in any of the events? Running, walking, strolling, crawling? I'm thinking about it, but to be honest, I'm pretty intimidated. I'd be curious to know if anyone else is thinking about it! Cashwise - Pillsbury Catalina Deal - Sunday Only! Yet another Catalina promotion that ends today, this one at Cashwise on Pillsbury products. Buy 6 participating products, get a $4 coupon. Final price: $2.48 for all 6 products, only .42 each! Final price: $3.10 for all 6 products, only .52 each! A GREAT price on these products! And remember, this deal ends today! Mix and match to use coupons on products you'll use. You may pay a few more cents per item, but it will be a great price on an item you'll use. Just a note on Cashwise: as we've talked about before, some of these coupons say Do Not Double, but your experience will vary from cashier to cashier. Most don't choose to manually override the double, which is given automatically. However, if they do, your final price will go up just a bit with the .50 coupons, and hardly any with the .95 coupons. Through March 14th, Hallmark Gold Crown Stores are giving each customer a FREE card from the New Kids Collection. There are 9 designs to choose from, and the FREE card offer is only while supplies last! Sunmart - Ziploc Moneymaker - Sunday Only! Edit: This deal is better than I thought! Many varieties are on sale for only $1.99 today and you are able to "roll" the Catalina coupon from 1 transaction to pay for the next! Tonight I spotted a catalina deal at Sunmart that is good only through today, Sunday February 21st. Buy any 3 participating Ziploc products, get a $2 coupon at checkout to use on your next order (catalina coupon). The lowest priced items were $2.33. Use 3 .55 Slider coupons (if this variety is included) from the 2/21 coupon inserts (will double to $1), or .40 coupons from the 1/10 coupon inserts (will double to .80) or the $1/2 coupon from the 1/10 or 2/21 coupon inserts. Pay as little as $3.99, get a $2 coupon back. As low as .67 each! Plus, if you haven't done so yet, submit for the $5 SC Johnson Rebate to make a sweet little moneymaker out of the deal! This $5 rebate requires the purchase of 3 SC Johnson products listed on the form, and three rebates are allowed per household! If you can wrangle enough coupons, repeat the Ziploc deal 3 times, submit for 3 rebates for a $9 total money maker, plus all 9 Ziploc products! Remember, this deal is only good through today, Sunday! Saturday Coupon Inserts and More! #1 Yes, those are inserts. Two of them! I found both inserts in the Saturday Star Tribune today! #2 FREE soda! As he was checking out, they offfered him a free 2 Liter of Diet Dr. Pepper Cherry. Mmm. Note: I find it somewhat disturbing that you can see me in the 2 Liter bottle. I'm not sure why, it doesn't have a close expiration date, but hey, FREE! Hope everyone else has the same luck finding coupon inserts for cheap today in the Saturday Star! 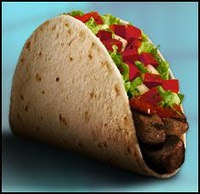 Taco Bell - FREE Fresco Taco is Back! The Taco Bell FREE Fresco Taco coupon is back! Hurry, the first 1,00,000 customers to redeem this coupon will receive a FREE Fresco Taco at Taco Bell! Final price: .33 each when you buy 3! Use the in-ad Sunmart coupons to get a 1 lb bag carrots and 1 lb bulk jumbo yellow onion FREE! Not bad for all three of these items! Purchase 3 and get one FREE with Buy 3 get 1 Free coupon from the 1/31 coupon inserts. Final price: $2.47 each when you buy 4. I've heard rumors of peelie coupons on the products at some stores. Because the coupon is for the 4th product free when you buy 3, you can still use Manufacturer's coupons on the first 3. Find 3 .75 peelie coupons for these (will double to $1) and your cost could be as low as $1.72 per tub! Use the $1/2 coupon from the 1/24 coupon inserts or that were previously available to print. Check out the New Our Family Coupons! Wow! As I was working on Sunmart Weekly Deals this morning I found NEW Sunmart coupons, and not only that, but in an easy to use coupons.com format! There is likely a print limit of 2 per coupon, but this may vary on some coupons. The coupons usually expire about a month from printing. Coupon I'm most excited about? .25 off 1 lb Our Family Butter. This will double to .50, so paired with a sale I'm hoping for $1.50 or less for a pound of butter! For those outside the Fargo Moorhead area, these Our Family coupons are good anywhere Our Family products are sold, like Economart, Family Food Stores and many more. Lunchables - FREE at Moorhead Hornbacher's! I made my customary Tuesday late night trip to Hornbacher's last night. Since I never intend to put it off til Tuesday night, it usually involves some mixed feelings on my part. (For example, is it really worth it? Are the deals really that good? Do I really want to skip a half hour of the Olympics to go? You understand...) Well, last night I promised myself a quick run to Hornbacher's. I was so serious about this that I purposely left my coupon binder at home. I don't know why I do this. Every time I do this I miss out on an awesome reduced meat deal or some other unadvertised thing that would have been free had I brought my coupons. Anyway, cut to the chase, the New Lunchables are only .99, making them FREE after the .75 coupon here doubles. (Be sure to print 2 per computer.) These make a great lunch for my kiddo on shopping days! I looked closely at the tag and it looked as if this sale would run through 3/10, but it did say "This Store Only." (Moorhead Hornbacher's) So, for you that shop at other Hornbacher's locations - you might want to print the coupon anyway and take a look. I often find these make their way to the "reduced for quick sale" meat spot for .99, so it's a good coupon to have on hand even if your store doesn't have this sale. Let us know what location you shop at if you find these! Have You Heard of All You Magazine? Well, here's a deal on Amazon that is going to help me stay on board with All You without having to shell out at the register each month. Right now, you can get 1 Year (12 issues) for only $15 on Amazon! That's only $1.25 per issue, and shipping is free, too! I've been holding out for a great deal on this magazine delivered to my door and I think this is it! To take advantage of this deal, head on over here to sign up! Whoops! Did I mention I had a birthday this weekend? Somewhere in the middle of that and parents visiting from out of town I completely forgot that I didn't post Hornbacher's deals! For what it's worth, here are a few deals that might be worth running out for if you need the items. Remember, sales at Hornbacher's end Tuesday night! Use the $1.50/2 coupon here. Final price: .93 each when you buy 2! Fishin' Tilapia Fillets, 16 oz $3.98! Old Orchard Frozen Apple Juice Blends .88! Final price: .63 each when you buy 4! That's the lowest I've seen on 100% juice! Note: I almost always use this .50 coupon at Sunmart, where Simply Asia Noodle packets are only .93, so FREE after the double! However, I think Hornbacher's carries these for only $1.09, so only .09 after coupon! Creamette 16 oz Egg Noodles, Food Club 5 oz Canned Tuna FREE with coupon and $25 purchase! Final price: .98 each when you buy 2! Use the .50/1 La Choy product coupon here. Use in-ad coupon, and 2 .60/1 coupons from the February issue of All You Magazine or 2 .40/1 coupons from the 1/24 coupon inserts. Both will double to $1 each. Final price: As low as $2.40 each! Hellman's Mayo varieties are on sale for $3.48, use the .75 coupon here (doubles to $1) and the $1 Starkist coupon here. Final price: $1.48 for both! Hot New Wild Harvest Organic $1 coupon! Go here to print a $1 coupon off any Wild Harvest Organic product. The Smartsource coupon will print automatically when you click on the link. In our area, Hornbacher's carries Wild Harvest Organic products. To see the products Hornbacher's carries, use the online shopping page of Hornbacher's website. Search for "Wild Harvest" to see all the products and sort by price. I LOVE coupons like this, you can choose the product you want to save on! Well, it looks like just one Red Plum coupon insert in this weekend's paper. As always, if you have no luck today, the Sunday Star Tribune costs only $2. For a full preview of the coupons this weekend, go here. FREE 5 Love Languages Seminar - Tomorrow! Living Hope Baptist Church in West Fargo is offering a 5 Love Languages seminar tomorrow, February 13th, for FREE! The event is scheduled from 9:45AM-4:00PM. Lunch, Childcare and the 5 Love Languages Book are all included! What a great idea for Valentine's weekend! I've not attended this seminar, but have read the book and can attest to it's practicality in learning to understand my husband and increase our awareness of how to love one another in a meaningful way. Very good stuff! If you're able, RSVP today by calling the church at 701-282-5076, or for more information, call Amanda 232-1309 or Lorraine 282-5076. To see the event info on Facebook, go here. Lunch, childcare, and 5 Love Languages book- ALL FREE! Happy Valentine's weekend and I hope some of you are able to attend this seminar tomorrow! More Coupons for Sunmart + Deal Scenarios! Plus, friend and reader Sarah let me in on a deal she got at Sunmart yesterday! Pay $1.90, and receive a $2 Catalina coupon good on your next order for purchasing 4 Pillsbury products! Looks like we have an overlapping Catalina deal! Qualifying products include Crescent Rolls, Cookie Dough, Grands, sweet rolls, Pie Crusts, Dinner Rolls, Loaves, Breadsticks or Pizza Crusts. Pay $2.90, receive a $4 coupon back to use on your next order! Nestle Baking Chips - only .68 at Cahswise! Nestle just released a new coupon that will sweeten the sale on Nestle Baking Chips this week at Cashwise! As you've seen in my previous posts, there are LOTS of coupons available for many of the "Catalina" and "Instant Savings" deals we see at our local grocery stores. These include the "Buy 10 participating products, get $5 off using in-store coupon" or "Spend $25 on participating products, get $10 coupon back at checkout to use on your next shopping order" promotions. At Sunmart this week, 10 Green Giant Vegetable Steamers coupons will net you 10 FREE bags of vegetables! I don't particularly need any of the other items included in the promo, but we'll always eat more frozen vegetables, especially for FREE! But, to bring them home, I've got to successfully check out with a cashier who will undoubtedly realize that my coupons combined with the store coupon and sale price are allowing me to take these home and pay nothing. And, most likely the cashier will look twice at the coupons and start to question - where did you get so many of these? Are these copied? How can you prove they're not copies? I've been there. Many times, actually. And, only one time did the manager actually refuse to take the my coupons. Had I known what I'm about to share with you, I would've been able to kindly prove to the manager that the coupons were, in fact, not copied, but legitimate internet printable coupons from well-known Manufacturer's websites. See the Dot-Scan Bar code in the upper right of the coupon? Below it is a really long number, 16 digits I think. When you print the same coupon 2 times from the same computer, but will have entirely different 16 digit numbers under that dot-scan bar code. I was fascinated when I first found out about this at www.veri-fi.com. On the left hand side of the coupons, you'll see a PIN Number. Though all the other numbers on the coupon match, the PIN number is always unique. Look closely at the line of fine print below the expiration date. In that line of fine print is another really long number. Each coupon has it's own unique long number. Why do I share this with you? Sending you to 6 different General Mills websites to print similar coupons then giving you a deal scenario that includes using multiples of similar coupons without explaining this information would be like throwing you all to the wolves. So, now you are an informed couponer. I hope it's been helpful, Happy Saving! Looks like a few good ones this week at Sunmart! Not a necessarily a great price on pork chops (more then $3/lb), but I mention it because this is a great week to shop the "reduced for quick sale" section at your Sunmart store. If you haven't found this section before, ask at the meat counter and they'll show you. It's often a small section hidden in the back of the meat department. Now, this meat does need to be used within a few days or frozen for later use. However, this is one of my best tips for getting a great price on meat. When these econopacks of pork chops go on sale 10/10, you can often find the 10 packs for as little as $6 (less than $2/lb) in the reduced meat section! Use the .50 coupon here (you get the coupon after you play a silly game.) Hopefully you still have some of these .50 coupons around or can use another computer to print more! They will double up to $1. General Mills - Awesome Coupon Deals! Use the .55/2 (doubles to $1) Grands Sweet Rolls coupon from the 11/22, 12/6 and 12/13 coupon inserts. Final price: .49 each when you buy 2! Use the .40/2 Grands Sweet Rolls coupons here or here. Final price: .59 each when you buy 2! Use the .50/1 coupon (doubles to $1) from the 2/7 coupon inserts (if Sweet and Salty variety is included in the sale). Use the .50 Steamer coupons here, here, here, here, here, here and here. Each coupon double to $1, and eat site allows two prints per computer. Tip: Using many of the same internet printable coupons can often generate some scrutiny from a cashier (and rightly so - they may look identical or copied at fist glance). However, there is a way to prove that your legitimate internet printable coupons are acceptable and not photocopied reproductions. For more information, stay tuned for a post to come this evening. Any other deals out there? Birthday Freebies - Need Your Help! What birthday FREEBIES do you know about in our area? If you know of something, any details you could provide in the comments would be great. Thanks for your help! Final price: $3.98/2 packages, less than .58/lb! Use the in-ad coupon for a FREE gallon of Food Club Orange Juice when you purchase 4 advertised items. Final price: Pay as little as $3.94 for 4 items and a gallon of OJ! Use two $2 Huggies diaper coupons here: IE or Firefox and a .50 wipes coupon from the 1/17 coupon inserts (will double to $1). Then, use the in-ad Cashwise coupon for FREE wipes when you buy 2 diapers. Final price: $11.96 for 2 packs of diapers and a tub of wipes - not bad! Use the .50/2 coupon here (doubles to $1) or the $1/2 coupon from signing up here (or in your email if you are already a subscriber. Final price: $1.18 each when you buy 2! Use the $1/4 coupon here or the $1/5 coupon from the 2/7 coupon inserts. Final price: as low as .73 each! Or, use the coupon for .50 off each item when you buy any 2 Old El Paso items that you normally use! Final price: .35 each when you buy 2! Use the $1/4 coupon that was previously available on coupons.com, if you were able to print it at the beginning of this month, or the $1/4 coupon here There is also another .50/1 64 oz juice coupon at that link as well, for use at Hornbacher's this week! Final price: .75 each when you buy 4! There was another ad with Truckload Sale Prices good through March 6th. I'll be back with match-ups for those after I post Sunmart weekly deals, as we have lots of time to get a great deal on these items! Anything other great deals at Cashwise this week that I missed? $4 off Diapers at Hornbacher's! Wow, this is one hot coupon! Baby Basics diapers, a Supervalu brand, are sold at Hornbacher's. They are regularly priced at $8.49/jumbo pack, but coupon is good for $4 off any purchase of $7 or more. Hold out for a sale and hopefully we can score diapers for a few dollars per pack! Print your coupon here. You can print 2 coupons per computer. To print your second coupon, just come back to this page and click the link again. More Kraft Deals this week at Hornbacher's! Cooked Shrimp Tail On, 50 ct, 12 oz $3.34! Note that these Kraft in-ad coupons are Manufacturer's coupons, and cannot be combined with other coupons for the same items. I'm sure there are high value Kellogg's coupon out there, but I can't find any right now... Anyone know of any $1 coupons for these cereals? Use the $1/2 coupon here: IE, Firefox and the $1/2 coupon IE, Firefox. Final cost: .48 each when you buy 2! Use the Buy 3, Get 1 Free coupon from the 1/31 coupon inserts. Use the .55/1 Cinnamon Toast Crunch coupon here (Manufacturer's coupon on the Target site - will double to $1), the .55/1 Trix coupon here (will double to $1) or the $1/1 printable here: IE or Firefox. Use the $1 coupon from the 1/10 coupon inserts or the January issue of All You magazine. Final price: .68 each when you buy 2! Village Inn: Free Pie on Wednesdays! What a fun freebie! Wednesdays are Village Inn Pie Rush Wednesdays, where you can score a FREE slice of pie with any purchase! I'm thinking a cup of coffee and a slice of pie for an inexpensive (and yummy) night out! Offer is from 10AM-10PM Wednesdays for a limited time. I don't know how long this will last, so it is probably worth calling ahead. Offer includes Lemon Supreme or Chocolate Cherry. Not valid with other offers or coupons. Tax and gratuity not included. Well, this weekend should be a good one for coupons! We should be seeing either 3 or 4 inserts, depending on how the General Mills coupons come. Look for a Smartsource, a Red Plum and a P&G insert. Also, there should be some General Mills coupons, either in the Smartsource insert or in their own. If anyone has seen them, let us know! We should see all 3-4 inserts in the Star Tribune today, but we've been shorted on Saturdays here in the Fargo Moorhead area for several weeks in a row, so be sure to check the paper before you purchase it! In case you're new around here, I recommend buying the Star Tribune in our area, and on Saturdays, you can buy the papers with Sunday's coupons for only .75! If you miss the paper or can't find one with all the inserts, you can still buy tomorrow's Star Tribune for $2. For a full coupon preview, go here. Has anyone found a paper with all the inserts today? Food Club Tortilla Chips FREE with coupon and $25 purchase! Food Club Taco or Fajita Seasoning .33! Use the $1/2 coupon from the Con Agra $17 coupon Booklet. Want one? Request it here. Have something to add or share? Let us know in the comments! Sunmart Salad Deal is back! Buy 2 Dole Salad Blends, get a Dressing, avocado, carrot shreds, and a cucumber all for $5.50! A pretty good deal on salad stuff if it's all stuff you need or will use. Tip: This is an exciting coupon! If you need juice, this is a good price, but if you can print the coupon and hold on to it, I'm sure we will see a better sale in the next few weeks! Use the .55/1 coupon that was previously available on Smartsource.com, or the .35/1 Turkey Sausage coupon if Turkey varieties are included. Final price: as low as $1.50! Tip: I often find meat coupons by looking closely to the shelves throughout the meat department, either on tearpads or little boxes that dispense coupons like tissues. Keep your eyes peeled! There are several Kraft Manufacturer's coupons available in the Sunmart ad. Keep in mind that since they are Manufacturer's coupons, you can't use more coupons on the same items. And, most of the items seem to be better priced at Cashwise and Hornbacher's where they are running the same coupons in the ads, but have lower prices on the items. I'm sure this isn't the most exhaustive list, so share with us if you found any other great deals at Sunmart this week! Hi friends and fellow cheapskates! I've neglected coupons for about the last week or so and yet my hands are still cramped up. Why is that? I've been over at The Paper Flower Shop, my other online home, making paper flowers. LOTS of them, in fact, for a wedding order. To be honest, I haven't even left the house since Wednesday or Thursday of last week, I can't remember which. So, back to reality! I'll have Sunmart and Cashwise deals posted tomorrow. And though I probably won't have time to post them, I did notice some new Unilever coupons this weekend that will match to some of the current Hornbacher's deals that will end Tuesday night. Go here to see the weekly ad online if you don't get the paper. My name is Sheila. I've always loved a good deal. Yes, I've even been called a cheapskate. But being frugal has it's benefits! Join me here as I post and share local deals with you for the Fargo Moorhead area! All content copyright 2009-2011, FM Cheapskate.